Check out our gallery of presentations and videos from previous public events. 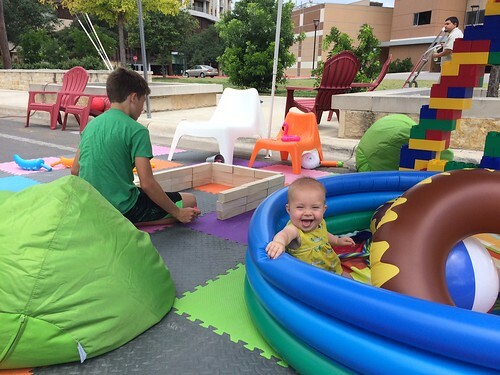 The South Central Waterfront Initiative coordinated with Our Congress Avenue to transform the northwest corner of Congress Avenue and Barton Springs Road into a Pop-Up Plaza. The pop up hosted a family friendly park with food trucks, games, and an opportunity to envision what the space could be. This one-day transformation is a preview of what the SCW team hopes will turn into a year-long demonstration project to bring more public space to Austin’s south shore. The plaza is part of a larger plan to realize the community’s vision for the South Central Waterfront district. Click here for a short video about the event. A small crowd came out to hear SCW consultants Margaret Robinson of Asakura Robinson and Abe Farkas of ECONorthwest talk in detail about how their work contributed to the physical and financial framework found in the SCW Vision Framework Plan (Draft). Long time followers of the SCW Initiative as well as those just learning about the plan enjoyed ice cream and music while checking out the latest waterfront information and talking with City staff. Families dropped by to pet a few furry friends in the petting zoo and see a large 3D model of the district. Thank you to all who came out and made this a fun and educational event. Scott Cataffa is principle of CMG Landscape Architecture, a nationally renowned design firm. CMG is working with Austin to design the green infrastructure network for the South Central Waterfront. During this talk, Cataffa showed examples of how his firm has worked in communities to integrate nature into the built environment. Internationally renowned urban designer, Harvard professor, writer and global expert on riverfront planning, Alex Krieger delivered a talk on the principles for creating vibrant, beautiful, and welcoming waterfronts.